The Biolite Stove is a remarkable piece of gear and something I was very excited about when I first heard of it. 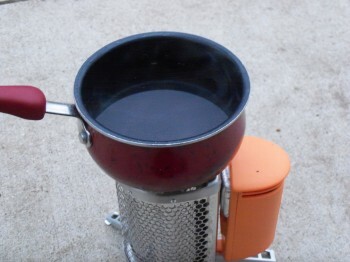 It is a small camp stove that gives you the ability to charge a phone or tablet while boiling water or cooking a meal. When Nightgear approached me about reviewing one of their products, I couldn’t pass up the opportunity to get a crack at a Biolite Stove. Side note: Nightgear is based in the UK. That’s across the pond from me, and likely many of you. However, I’ll tell you something. Their package arrived to me faster than many items I’ve ordered domestically. I had the Biolite Stove in my hot little hands within maybe three days from the time the order was placed. When I unpacked it and folded out the legs, I was rather surprised at how small the unit was. A little over eight inches high and about five inches wide. It comes in two parts, the stove itself and the battery pack with internal fan. The battery pack hangs on the side of the stove, rather ingeniously attached via a tab that fits into one of the legs. There is a metal tube on the battery pack that slips through a hole in the stove, shown here. All told, the Biolite Stove weighs about 33oz, so plenty light enough to toss into a pack. In addition to the stove and battery pack, it comes with a nylon sack to pack it in as well as a small USB cord and some fire starters. The instructions state to charge the battery pack fully before the first use. This is done by plugging the USB cable into the battery pack and then into your computer. When you plug it in, there is an orange light located right near the USB port on the battery that blinks slowly until the unit is fully charged. This took a couple of hours. I then let the unit sit unplugged for several days and it kept the charge just fine. The stove is fueled by biomass–sticks, bark, leaves, that sort of thing. So, when it came time to test out the stove, the first thing I did was gather fuel. I filled an old ice cream bucket with twigs and bark. I put a bit of dryer lint and some torn up cardboard egg carton in the bottom of the stove, added some sticks, and dropped in a match. In just a few seconds, the tinder was burning well and the kindling was starting to catch. At this point, the instructions state to turn on the fan by pressing the on/off button. The fan has two settings, low and high. I turned it on to low and the fire almost immediately began to burn stronger. I added a bit more fuel and turned the fan to high. This was the result. Now, here’s where the Biolite Stove gets pretty nifty. As the fire burns, the heat produced is turned into electricity via a thermoelectric generator in the battery pack. This energy powers the fan, which in turn makes the fire burn hotter and cleaner. Once the fire is going, there is almost no smoke. Now, the true test of any stove, in my opinion, is how quickly it will bring water to a boil. I filled a pot with about 2-2.5 cups of water and placed it on the stove. Within about five minutes, it was boiling rather well. Remember what I said earlier about the thermoelectric generator powering the fan? Well, on top of doing that, once the fan is fully charged, excess energy is sent to that USB port so you can use it to charge your phone or tablet. What you do is, as you’re boiling your water, watch the light at the USB port. When it goes from orange to green, you’re good to go with charging your device. From the time I had a good fire going in the Biolite Stove, it took about seven minutes before it was ready to charge. The metal parts of the stove do get hot, of course, so be careful when you plug in your USB cord. I used an oven mitt to brace the stove as I plugged in the cord. When you plug in your device, you’ll notice a very slight diminishing in the fan’s power. So, how did it do with charging? Well, I had mixed results. According to Biolite, it takes 20 minutes of charging to add about 60 minutes of talk time to an iPhone. I tried two different devices, a Kindle Fire tablet and a Samsung 4G LTE phone. It took only about five minutes of charging to bring the tablet up a full 10% in battery power. The phone, though, took almost eight minutes to move even 2%. Now, there are a couple of variables at work here. 1) Ambient temperature. It was about 30F outside as I ran these tests. Devices can take longer to charge when they are cold. But, I didn’t want to cheat the test by adjusting the conditions to be more favorable, such as putting the phone in my pocket while it charged. 2) Strength of the fire. The hotter the fire, the more energy that is converted to electricity. Being an open flame, it is virtually impossible to regulate the fire precisely. How did the stove do with fuel consumption? I went through about half that ice cream bucket of fuel by the time I had the water boiling. Your mileage may vary, of course, as different fuels burn at different rates. One thing that is worth noting, and something I overlooked originally, is that the stove will only charge devices while the fire is going. The battery pack cannot be charged up and then used to charge devices later. It is only when you have a good, hot fire and that light turns green that you’re able to charge your phone or tablet. At the end of the day, here are my final thoughts on the Biolite Stove. First, it makes for a great portable camp stove. It is small and light enough to toss into a pack and carry all day long. Second, being that it burns biomass, there’s no fuel to carry with you. In many if not most environments, it shouldn’t be difficult to find small sticks and such to burn. As for using it as a source of energy in the field, it does work, but perhaps not quite as well as I’d hoped. It will certainly give you a way to charge your phone or tablet, but it isn’t going to be a quick thing. But, if you’ve stopped for the day and are just sitting around the fire, the stove will keep you warm while charging your phone, nothing wrong with that plan at all. Visit Nightgear for more info about the Biolite Stove as well as their other great products.